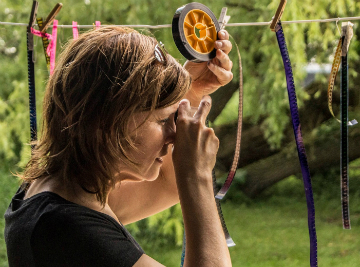 Cecilia Araneda is a Chilean-born/Canadian experimental filmmaker who works in both celluloid and digital mediums, but focuses primarily on analogue filmmaking techniques, such as filming with 16mm Bolex cameras, editing via flatbeds, employing optical printing, etc. Born in Chile, Araneda came to Canada as child as a refugee and grew up in northern Manitoba. After studying playwriting (BFA – York University) and screenwriting (MFA – University of British Columbia), she has made numerous short films that are conventional narrative and documentary in nature or that are experimental hybrids of such. In addition to her filmmaking, Araneda has been a strong promoter of other filmmakers' works, especially those from frequently overlooked social groups, such as indigenous filmmakers in Canada and women Latin American filmmakers. From 2006 to 2017, she served as the Executive Director of the Winnipeg Film Group and has been the first Executive Director of VUCAVU. In 2005, she co-founded the WNDX Festival of Moving Image and, in 2001, she was recognized by the Province of Manitoba as a woman media artist working for social change. She is based in Winnipeg, Manitoba. Experiments in Cinema v.5.1 will screen awesome experimental films by Vanessa Renwick, Kerry Laitala, Sylvia Schedelbauer and more. Toronto’s 2010 Images Festival runs April 1-10 and will screen films by Zachary Epcar, Laida Lertxundi, Kevin Jerome Everson, Naomi Uman and a lot more. The 12th annual Antimatter Film Festival features great experimental films by Martha Colburn, Clint Enns, Damon Packard, Leslie Supnet, Penny Lane and more. The 11th Antimatter Underground Film Festival is screening films by Clint Enns, Craig Baldwin, G.J. Echternkamp, Martha Colburn, Mike Rollo, Jem Cohen and more. The WNDX Underground Film Festival is a three-day event in Winnipeg, Canada of terrific short films, including ones by Mike Rollo and Brett Kashmere.